It had been a long time since I took the twisting country backroads through Washington County to the small town of Cambridge, NY, but once there I felt this warm nostalgic feeling wash over me. Not much in the town seems to have changed in the 9 years since my last pass through, but I certainly don’t remember this quaint and clean bookshop, full of bestsellers, trinkets, and discounts that will make any bookworm happy for having trekked through forests and farmland to get there. As I walked up to the shop I saw typewriters and piles of books greeting me in the windows—a good sign—and inside were displays, columns, and tables of current bestsellers, notable biographies, bright beautiful coffee table books, and chairs for browsers to relax and read. To the right were more tables and aisles of fiction and staff selections, and though each section and subcategory of fiction didn’t overwhelm with volume (poetry and fantasy, for example, we a tad light), the titles available were of the big names and recent hits you’d want and expect. The aisles were also movable, giving the shop a lot of room to play with for events and readings, which is fantastic for a small town shop like that. Across the way, to the left of the front door, is a side room with all manner of children’s books for younger readers, books that will both entertain and educate, with trees painted on the walls and seating for tykes to enjoy. You’ll find YA and teen reading in the main room further in the rear alongside rows and shelves of nonfiction, with all the main categories covered—history, cooking, gardening, crafts, science, reference, and sports. The front desk area is also chock full of gift books, trinkets, toys, magnets and pins, and totes, all the fun accessories book lovers like. The real treat was in the very back of the shop in a rear room, where there were shelves of deeply discounted books, some used, some new, all at prices that will get your heart beating faster. I found one I wanted for a while, The Devil In The Valley by Castle Freeman, JR, for just $3. There are plenty of steals back there for both adults and kids, so make sure you check that out. All in all, this shop covers all the bases and has plenty to offer any visitor. Grab a bag, fill up, and enjoy a coffee or a baked treat at one of the shops down the street. It’s a unique little town and well worth the visit. Atmosphere — A bright fresh shop with plenty of space, books, gifts, and large windows making any visit a pleasant experience. Quality — The books are new, the gifts are unique, the typewriters are old but clean and inviting. Quantity ­­— Some sections are a little light but for the most part this shop has plenty of books for a small town shop. Diversity — They cover all the bases here, with a lot of nonfic, bestsellers, children’s books and YA/teen. Affordability — Typical prices in the front rooms, incredible discounts in the back. Just what you want to see in a shop! Amenities — They had plenty of gifts, some seating, and their own line of bags for easy shopping. Location — It’s a little bit of a trek to get out there, but Cambridge is a pretty little town and the shop is on a cute block with other stores and cafes. Drive, park, stroll, enjoy. Customer Service — The woman behind the counter was very pleasant and helpful! 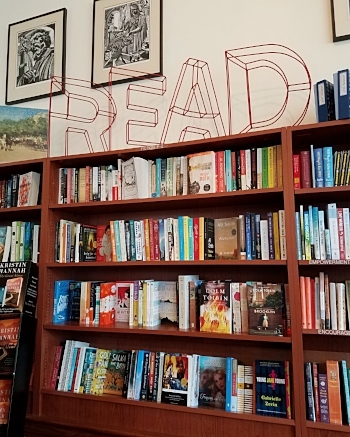 Overall — This shop is the icing on the cake if you’re looking for a fun little afternoon drive into the country for coffee, treats, books, and a bite to eat. Get out there and enjoy the summer with some books from Battenkill!